I am passionate about good coffee and promoting breast cancer awareness so I am very excited to introduce you to Coffee Beanery. This premium coffee company based out of Flushing, Michigan roasts and packages their premium coffee which has been sold in their stores since 1976. 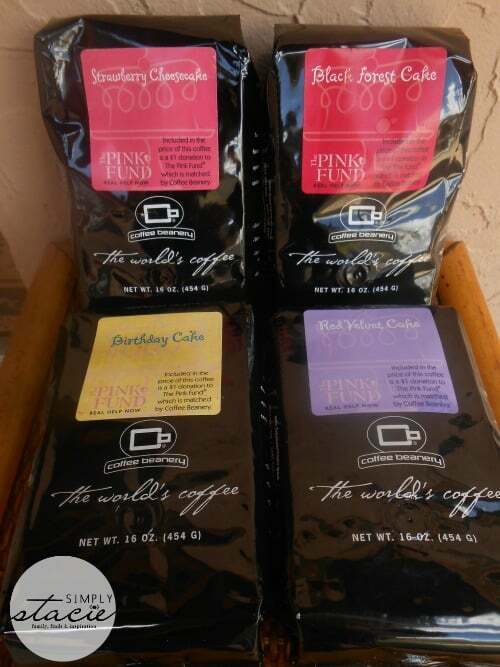 In support of National Breast Cancer Awareness Month, Coffee Beanery is donating $1 to The Pink Fund for each pound sold of their newest cake flavored coffees and is matching each donation with a $1 contribution for a total of $2.00 per pound! Cake flavored coffee……ladies, I am confident that got your attention! This decadent coffee collection features Strawberry Cheesecake, Red Velvet Cake, Birthday Cake and Black Forest Cake. Each of these cake flavored coffees is so rich and delicious, bursting with baked cake flavors while the aroma emitted while brewing is intoxicating. As a woman who is watching her figure, I appreciate that I can enjoy all of these coffees without worrying about my waistline because this collection is sugar-free, alcohol free, lactose free and Kosher certified. The Strawberry Cheesecake Flavored Coffee ($14.99 for one pound) smells and tastes like a ripe, juicy strawberry blended into a creamy cheesecake. The freshly roasted Arabica coffee bean taste is exceptional too making this such a wonderful indulgence. If you love a good strawberry cheesecake then you are sure to love this coffee from Coffee Beanery! My husband’s favorite is the Birthday Cake flavored coffee. He doesn’t normally like any type of flavored coffee but he declared this flavor to be “absolutely delicious” as it smells and taste like moist yellow cake, notes of vanilla and of course sprinkles! Another favorite when I am craving a lush dessert is the Black Forest Cake flavored coffee. I was overwhelmed with the aroma and taste of chocolate cake, chocolate and whipped cream and notes of maraschino cherries. I could drink this particular flavor of coffee every day for the rest of my life and be satisfied…..it is that delicious! Last but not least, the Red Velvet Cake flavored coffee is luscious and bold just like the name-sake cake. It is the perfect combination of sweet and tangy (I would swear it must have cream cheese in it but yet it is lactose free). Brew a cup of this Red Velvet Cake and you are going to fall in love with it! 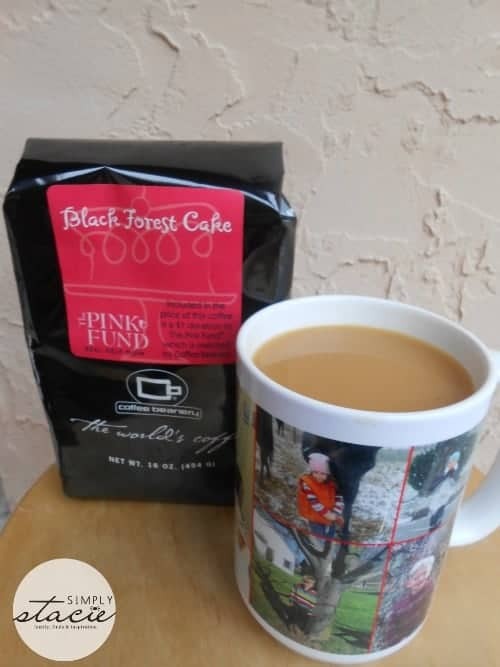 You are invited to visit the Coffee Beanery website to purchase your favorite specialty, premium cake flavored coffees and feel great that you are helping to support a wonderful cause in the fight against breast cancer, The Pink Fund. Available in ground or whole beans and regular or decaf brews (they are famous for their Swiss Water Process Decaf)……….the Coffee Beanery is sure to have your perfect coffee and gift ideas for fall and the upcoming holiday season. Hawaiian Coconut would be my favorite flavor! I’d love to try the pumpkin spice!!! I would love to try the Peppermint Twist Flavored Coffee. I would love to try the Pumpkin Spice flavored coffee! The Republic of Tea’s Ginger Peach is one of the few things that has let me get through my morning sickness! The chocolate covered espresso beans! I’d like to try the Hawaiian Kona Coffee. Thanks. I’m craving a cup of the cinnamon holiday blend right now! The Capresso Coffee Burr Grinder would be a great product to own. Pacific dark roast coffee sounds ooh so good . I would like to try the frosted carrot cake flavored coffee, that sounds like it would be amazingly good. I love a dark roast, so the Espresso Perfecto® Coffee sound awesome! I love French presses! The 3-Cup Bodum “Brazil” French Press in green is particular pretty. They all sound good. But I would try the Cinnamon Holiday Blend first. I love coffee. I would like to try the Pumpkin Spice! Well, this would be for my husband, not me — he LIVES on coffee, whereas I’m a tea drinker — but I know his tastes and I can say that he would love to try the Cinnamon Holiday Blend Flavored Coffee. I’ve got two – Irish Cream and Chocolate Mint Kiss! I would love to try the birthday cake flavored coffee! The 3-Cup Bodum “Brazil” French Press in red would be lovely! It’s not that expensive either which I love!! French Toast coffee sounds mouthwateringly yummy! The Sweetest Day Deluxe Basket. Very nice! I’d like to try Cinnamon Holiday Blend Flavored Coffee or their pumpkin spice flavored coffee besides the birthday and red velvet cake ones. I would like to try the French Toast flavor. It sounds wonderful!! I’d love to try the Pacific Dark Roast Coffee. I love a really dark coffee. I would love to try the Pumpkin Spice Flavored Coffee. I would like the Capresso SG120 12-Cup Stainless Steel Coffee Maker as mine is getting old. I’d love to try the Birthday Cake flavored coffee. This time of year I’m all about the Pumpkin Spice! YUM!! They all sound delicious…especially anything pumpkin!